Inknbeans Press (Murrieta, California, 2016). At the end of the first chapter of “The Fool of New York City,” readers might be wondering, “What exactly am I reading?” because they have met a homeless man who on a cold night is rescued from an abandoned building in Hell’s Kitchen by a giant — nearly 8 feet tall, a former college basketball player who wears size 18 Nike facsimiles and whose “job” is helping people. Those who continue reading will embark on a story of love, friendship and adventure. It involves defeat and triumph, death and resurrection as the 20-something “de Goya” rediscovers — with the help of the giant, Billy Revere — who he really is. This is a story about love lived, not preached, and about love lost and found. This is not a sappy romance but rather a tale of a search for answers about life and the meaning of events that have occurred in that life. The story blends the poignant with the humorous — the latter often related to Billy’s size. O’Brien rewards readers with an enjoyable sojourn through this “strange land” with “de Goya,” Billy and the diverse cast of characters who come in and out of their lives. His is a well-crafted adventure worth reading. 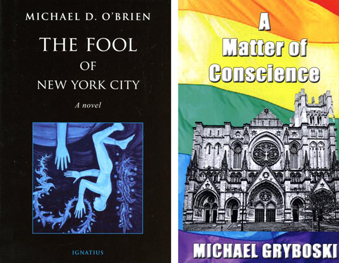 In developing and writing “A Matter of Conscience,” Gryboski would have done well to examine the work of the late Father Andrew Greeley and the late William X. Kienzle for examples of how to write a church-themed story that will engage readers. If he had done so, “A Matter of Conscience” might not be the volume of unrealized potential it is. The story — Father Thomas More, a priest considered a candidate for the episcopacy, terminates a lifelong friendship with a governor and is tried in a court of law for upholding marriage as a sacred union between a man and a woman — is timely. But as told by Gryboski, it unfolds too hastily with characters inadequately developed and with disjointed storylines that knot rather than converge. The dialogue is clumsy, some occurrences unrealistic, e.g., a jury deciding the outcome of a case without leaving the courtroom to deliberate, and lack of knowledge regarding church and church terminology, e.g., constant reference to the priest’s Roman collar as a “dog collar.” Together, they beg for a massive edit or a total rewrite. Either should have taken place before this book was published. Olszewski has written for and edited diocesan publications for more than 40 years.